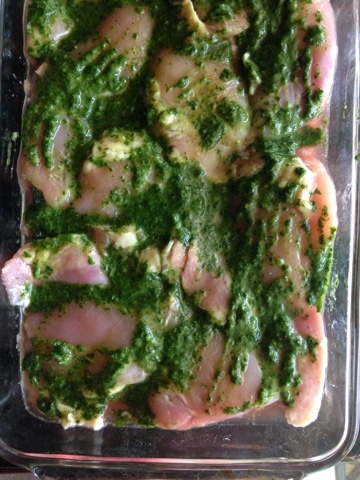 One of my favorite and easy dishes is marinating & grilling organic chicken thighs. I use a lot of chicken thighs because they are cheap and moist and boneless. This basil sauce is super easy and delicious. I like to use my mini blender. I stuff it full of basil leaves, 2 frozen cubes of garlic (equal to two cloves), sea salt, fresh pepper, & enough avocado oil to make it runny. 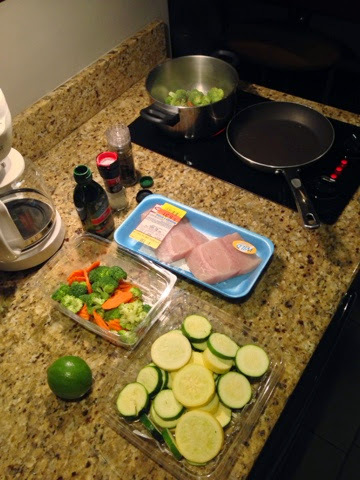 When I cook, I use a lot of ratios and not exact measurements. It gets easier with practice but in this case, 2 or 5 leaves aren't going to make a big difference. You are going for flavor here! I dump the sauce all over the chicken and let it marinate for 30 minutes, flipping over, & then grill them on med-low till cooked through. My boys like it when I slice them up. This sauce is great for a lot of applications such as with tomatoes & mozzarella, on beef, or mixed in cooked pasta or rice. Or on Instagram at "thelunchlady"
To get the most up to date posts! I HAD to go! My husband was, after all, surprising me with a trip for our 20th anniversary. I can't lie and say I wasn't a bit nervous about airport food. 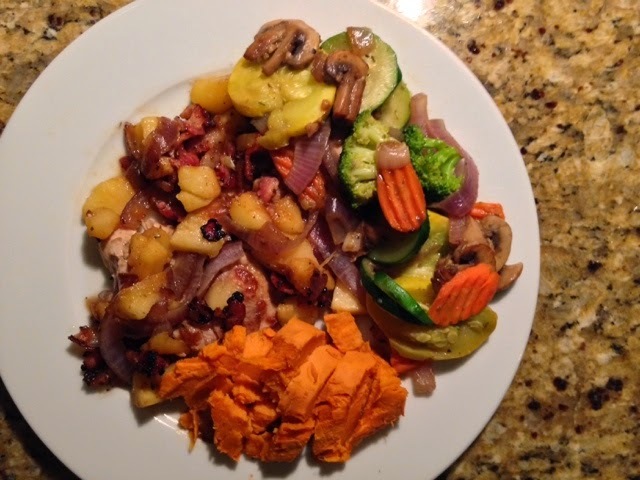 So I packed cooked bacon and baked sweet potatoes! When we got to our layover airport (Dallas), literally the ONLY AIP friendly food was at a small Mexican food joint. They offered Romaine salad with a million toppings (corn, cheese, beans, tomatoes - you know, ALL things I had not re-introduced yet!) So I bought the salad without all the toppings, much to their dismay! $7 and probably the most expensive lettuce I've ever bought! I loaded it with bacon, sweet potato, and a side of Trader Joe's applesauce. Sometimes it's survival but I was nice and full. And nourished. I found a great restaurant in Laguna Beach that offered all different Tapas or options as a meal. 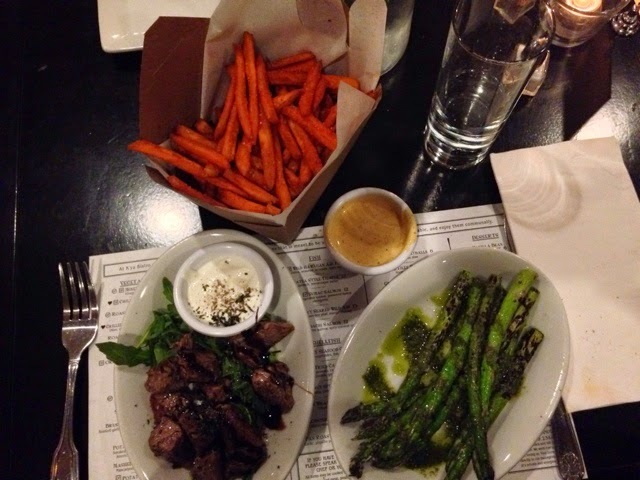 I got sirloin tips (I skipped the sauce), asparagus, & sweet potato fries. 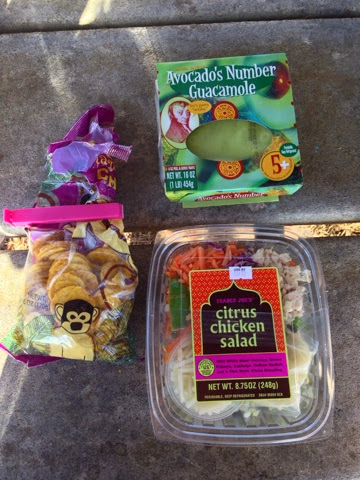 Lunch "to-go" is a tough one at Trader Joe's if you are trying to eat AIP friendly. The best I could do was plantain chips with guacamole and this salad. I skipped the dressing but even the chicken had some crazy additives. I had heartburn all afternoon and I NEVER have heartburn! Our studio had a teeny kitchen with a cooktop, microwave, and basic necessities. We had a great little store, Ralph's, around the corner that carried grass fed, free-range, and wild meats and fish. We bought a tiny bottle of olive oil, sea salt, and herb mix. 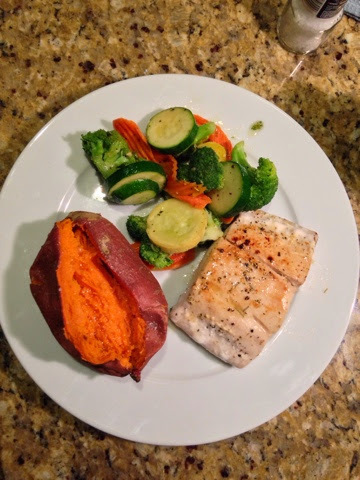 We got some prepped raw veggies, wild mahi mahi, and a couple sweet potatoes (I had to microwave them). 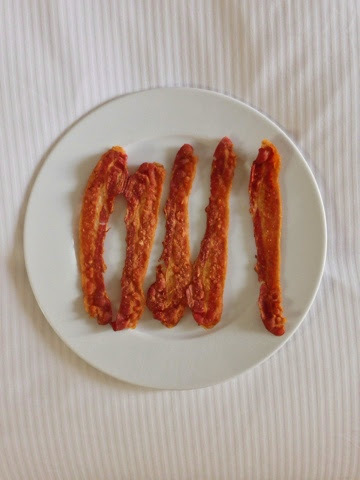 Just about every restaurant or hotel that serves breakfast has bacon and fresh fruit on their menu. AIP friendly. I literally ate bacon the entire week I was gone. 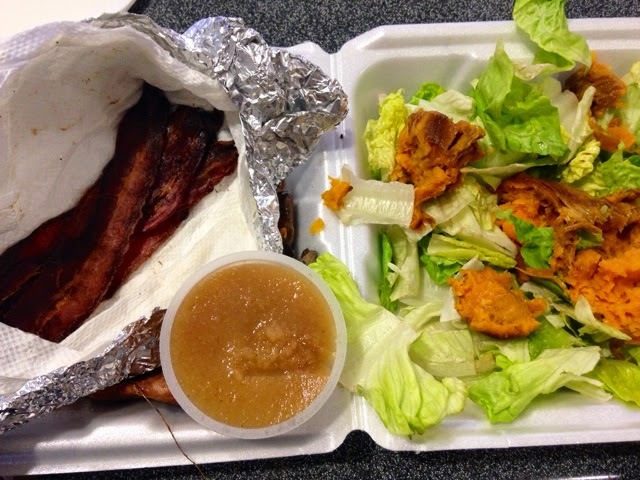 There was a small cafe across the street from our place that served salads. 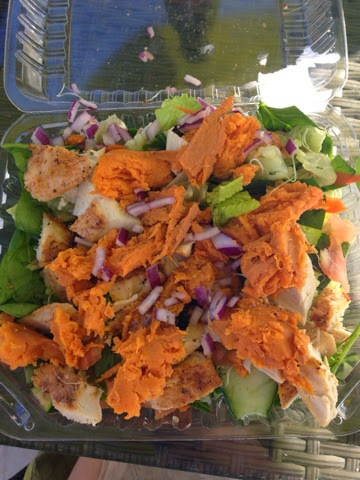 We got ours "to go" with chicken and veggies. I added some sweet potato, avocado, and red onion. Filling and satisfying. 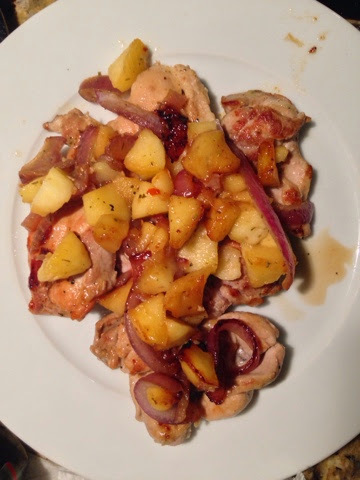 One night I made chicken thighs cooked with apple and onions. 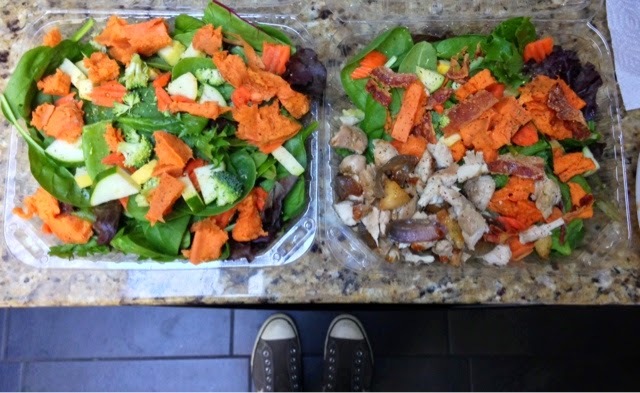 Airport food is a tough one, so for my trip home, I packed our own giant salads. As long as you carry it in a plastic bag, customs doesn't mind at all! I added a banana and a container of applesauce to the bag. Right before we got to customs, I added olive oil so it wouldn't get too soggy. Turns out, there was a cafe near our Gate that had nice homemade dressing. They gave it to me for free! 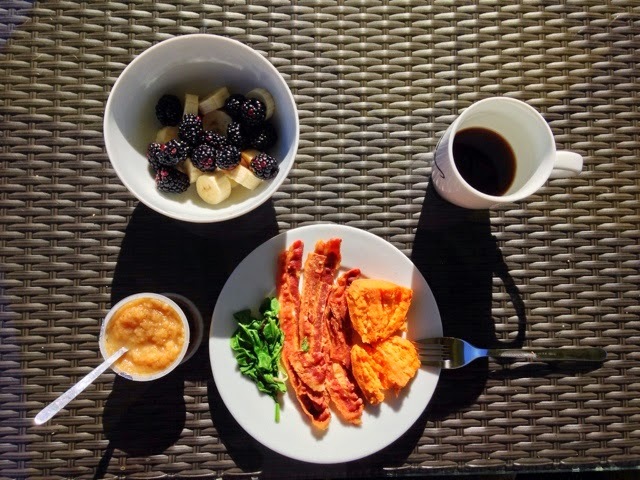 The morning we left I HAD to eat leftovers, so a bit more fruit than usual, bacon, sweet potato, spinach and my usual Americano coffee. Coffee is the only non-AIP thing I have regularly. Burgers are usually a good choice. I ordered an Angus burger, no bun, and they wrapped it in lettuce for me. I had about 3 of the fries because they weren't that good but they did give me a double burger! I'm a sushi lover. Truly. So abstaining from my favorites was hard for me at first. I'm happy to be able to eat a small bit of rice here and there. It's a nice resistant starch. 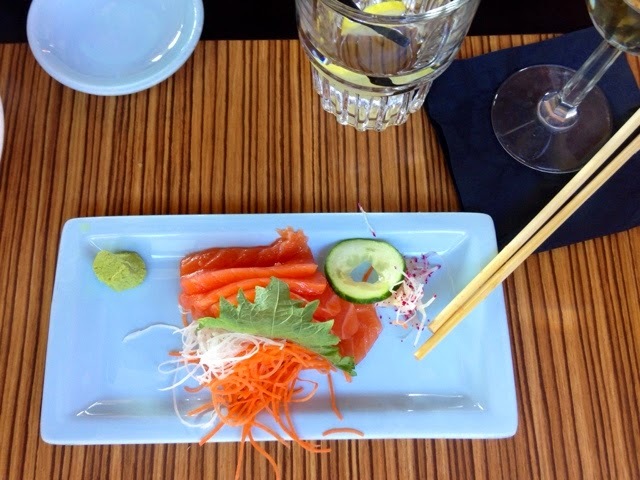 This lunch was at an amazing little sushi place overlooking the water in Laguna Beach. It also served as our Wedding Lunch with our good friends. The purpose of our trip to California (my first time!) was to celebrate our 20th anniversary. He surprised me with renewing our vows on the beach and arranged for our friends to meet us! They moved out 13 years ago, he's a pastor, they live 1 1/2 hours away, so I had NO idea they would come. It was all so romantic and a huge surprise, complete with a proposal on the boardwalk. Sashimi is a good safe bet. I also had a dinner sized salad and a few pieces of California roll. I skipped the soy sauce. Along with these meals, I also packed snacks like an Epic Bar, Trader Joe's Coconut + fruit bars (apple, mango, strawberry), dried mangoes, applesauce packs, and dried coconut flakes, a small container of coconut oil. I bought a bunch of bananas, apples, and plantain chips at the store. My best and completely AIP meal was at the Soho House in West Hollywood, a member's only club for the Hollywood crowd. No camera phones allowed so I couldn't snap a shot! But I had chicken paillard, baby chard, carrots, and purple sweet potatoes on the side. It was wonderful! 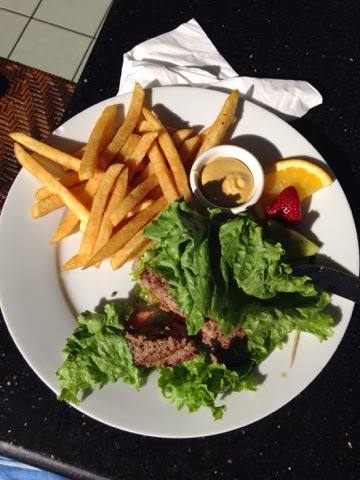 I never went hungry on this trip so it is completely possible to eat well, to eat AIP, and be nourished! The Autoimmune Protocol has changed my LIFE! I started to see some changes in my body pretty quickly. 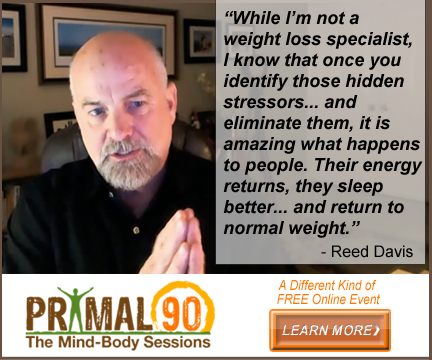 Initially, I lost 15 pounds but more noticeably, I stopped having my regular headaches. My brain fog went away and I started having more energy. It turned out that I'm highly reactive to gluten and was showing inflammation in my gut. Overall, I have seen a lot of improvement in my aches and pains and some of my skin issues. I have eczema and psoriasis and have less flares than previously. It's been 6 months now. Of course it has changed the way I cook and bake. No more flour cookies and cinnamon buns or cakes. But, I mostly don't miss them anymore. I can make some banging brownies out of plantains! And delicious Coconut Banana Smoothies... I don't really need to snack much because my meals are very satisfying, full of good fats, grassfed or pastured meats, good starches, and lots of veggies. I'm nourishing my body well for the first time in my life. And the really weird thing? My cellulite is gone. One of the blogs that I found most helpful is www.thepaleomom.com She is a doctor, scientist, and backs up her information with tons of real research. It's helping thousands of people being diagnosed with thyroid issues, skin issues, MS, and all kinds of autoimmune diagnoses. I'm really excited to have found healing like this. It's helping me take care of ME so that I can take better care of my family! She's an inspiration to me. However, I like tweaking her perfection to healthy perfection. I love using organic ingredients and a bit more of a clean and whole grain approach to food. Her Cinnamon Roll recipe is amazing. I'm not about to fix what ain't broke but I will "healthify" it by tweaking the flour and using all organic ingredients. It cleans it up a bit. I really need every excuse in the book NOT to eat these! I've been making her recipe so often that I have it memorized. Is that bad? Hey, I have a lot of hungry boys to feed in this house. And I made the "mistake" of making these for my nephews so now I'm pretty much required to bake these every time they sleep over. I often bake with organic Spelt flour which is considered an ancient grain. It's higher in protein and a bit easier to digest, and doesn't give you that whole "wheat" taste that I do not like. Since I bake these regularly, I've decided to start tweaking the flavors I use. I like to think of it as a seasonal cinnamon bun. Pictured are Apple Cinnamon and Strawberry Jam. I have great plans for blueberry and peach season coming up. Stay tuned! I love "apple-anything" so I thought I'd try putting bit of apple on the dough before I rolled it out. This recipe makes about 24 large cinnamon rolls. I was going for 2 flavors. 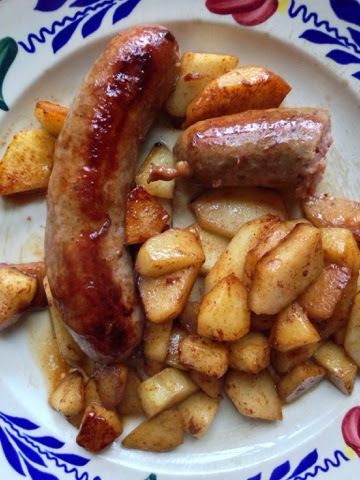 I use organic spelt, grapeseed oil, organic sugar, raw organic milk, organic butter, organic apple, organic cinnamon, and homemade strawberry jam. The Strawberry flavor has become a family favorite. I actually went strawberry picking twice so I would have enough strawberries to make more jam. I just add a bit of strawberry jam to the icing to give it some extra color and flavor. In largest cooking.soup pot you have, heat these 3 ingredients, stirring till just about to boil. Turn off and cool for 45 minutes. Mix all together with long wooden spoon. Cover. Leave in warm spot for at least 1-2 hours. I find that if I make the dough in the morning, it rises even more if I don't make the buns till late afternoon or evening. 1-2 cups organic spelt flour. Knead into a ball, adding flour till pliable. Sprinkle flour on clean work surface. Whatever looks good and will also roll up. Cinnamon Sugar: Mix 1-2 teaspoons of cinnamon with 1 cup sugar. Sprinkle over the butter evenly. With a sharp knife, cut down the center of the divide. Roll up the dough so the long part is the length of your roll. You want a long roll of dough. Pinch the seams shut all around so you don't lose apples when you cut and pick up your rolls. Grease 4 pans. I use 2 glass 13x9 inch pans and 2 pie dishes. You can use any oven safe pans. Use what you have. Cut each roll in half once. Then each roll in half again. I cut the remaining rolls in 3 (so make 2 slices). Again, do what you like and what seems to work for you. I usually put 5-6 in a pie plate and 6-7 in the large pan. The ends of the rolls are usually a bit smaller. Let the rolls rise in a warm place for a while till they fill out the pan a bit more. Bake at 350 degrees F for 18-20 minutes or till the top is browned slightly. In a small bowl, add 2 cups organic powdered sugar, 1/2 teaspoon vanilla extract, and enough milk to make the mixture runny (maybe 1/3-1/2 cup?) Use a whisk and add a bit of milk a little at a time.